Mayo Clinic patient Don Salamone is proof that being in great shape before undergoing a heart transplant can enhance recovery. Even while tethered to a ventricular assist device that kept his heart functioning until the transplant surgery, he pushed himself to work out on a stationary bike for two hours daily and walked several miles on a treadmill. While he could handily beat the competition in races before he received the implanted device, he couldn’t beat viral cardiomyopathy, which makes it harder for your heart to pump and deliver blood to the rest of your body, and can lead to heart failure. Don underwent his heart transplant surgery in October 2012. True to his mission, he spent only eight days in the hospital following the surgery. “I made a pledge to be in good shape before the surgery and to always honor my responsibility to my donor to take care of this heart,” Don says. As a result, within days of his surgery, he was up early, walking laps, training and eventually competing in numerous runs in Arizona and elsewhere. Fast forward to Jan. 16, 2015. Now close to age 60, Don was living his promise. He was at the 10K starting line at the popular P.F. 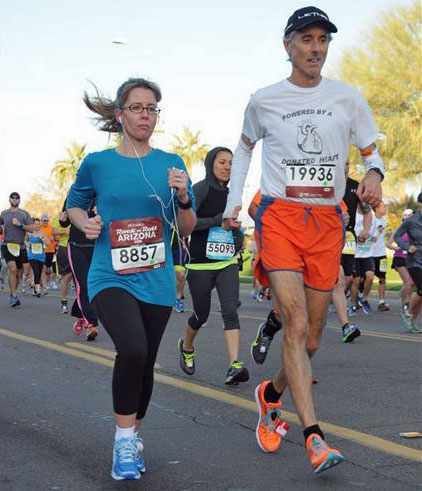 Chang’s Rock 'n' Roll Marathon in Phoenix, where some 30,000 athletes participated. Staley finished with her best time, shaving three minutes off her best practice time, and arriving at the finish line in 54 minutes, 39 seconds. “Don was amazing and pushed me to do my best, and gave me words of encouragement along the way,” she says.